Make a memorable first impression for your home. Your bedroom is tidy. Your kitchen is spotless and organized. Your carpets are vacuumed and your pictures are straightened to perfection. From top to bottom, the rooms and living spaces throughout your home are beaming with proof of pride and care as they stand poised to charm potential homebuyers into falling in love at first sight. However, when selling your home, it becomes much too easy to overlook the all-important first impression: the landscaping. While the home itself is the ultimate deciding factor in the sale, many prospective buyers have been found to disregard the house because of the appearance of the property on which it sits. Simply, people will often drive by your home before actually making an appointment to step inside. 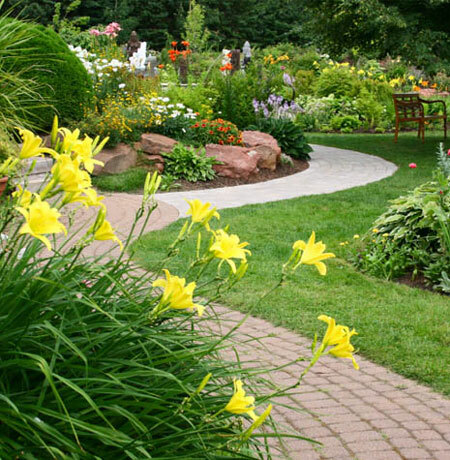 If your landscaping produces an uninviting, unpleasant feeling for the buyer, they are likely to skip the appointment and move on to greener pastures. Lawn Control – Often the majority of space for the front of the property, a healthy, green lawn is a must for any tidy property. While some recommend regular fertilizer treatments up to a year before listing the house, you can green up your lawn with just a single application—if done with the proper fertilizer. Pick up a broadcast spreader and research the correct treatment for your area and the time of year. Use pre-emergent herbicides to kill off any crabgrass or weeds, and be sure to cut your lawn regularly with a sharp mover blade. On the Edge – Trimming a fresh, distinct edge along the border of your grass makes the lawn look meticulous and well-kept. Simply curving the edge of any flower beds can add a stately appeal. Adding a physical border such as rocks or wood produces clean lines and minimal intrusion. Maintaining your edges keeps your grass from growing where you don’t want it. It also helps keep any mulch out of the lawn where it can damage mower blades. Mulch Improved – Adding mulch to your property helps improve the health of the soil while enhancing the appearance of your landscaping. Cover garden and flower beds with a layer of mulch to suppress weeds and reduce the need for water. Thicker mulches can reduce water usage by up to 50 percent. Create decorative mulch borders for walkways, flower beds, and around trees and shrubs. Annual additions to mulch only should be made to maintain proper depth. Flower Power – For a touch of color and beauty to your landscaping, designate no-traffic areas for you flower beds. First, you need to clear away any unwanted vegetation and take stock on what you have to work with: soil, space and sun. When planting, try layering your flowers by putting the tallest flowers in back, the shortest up front and the remaining in the middle. A layered flower bed should provide maximum visual appeal when the plants mature. All the Trimmings – Keep your trees and shrubs from getting to shaggy and disheveled with regular trimming and shaping. Also, clear away any debris from your lawn such as pine needles, branches, leaves and pinecones. Trimmed trees and shrubs give a look of slow growth and easy maintenance. Since potential buyers don’t want to have to imagine the amount of work that awaits, you don’t want your landscaping to appear as though it is a lot of work to keep up. This is a wonderful, insightful blog. Thank you for the information!